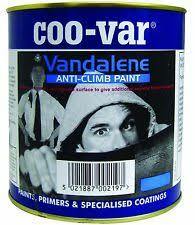 Coovar Vandalene Anti-Climb Paint protects against intruders and vandals. Vandalene Anti-Climb Paint. Break-ins, burglary and vandalisation of both private and industrial property is on the increase. Vandalene is a simple, durable and cost effective way of protecting commercial, industrial and domestic property from intruders and vandals. Developed in conjunction with crime prevention officers, Vandalene is easily applied to most surfaces, including metal and wooden fences, brick walls, sills, gutters, fall pipes, roofs and even chain fencing. Coo-Var "Vandalene" Anti-Climb paint will help to protect your property from uninvited intruders with a thick, slippery, sticky non-drying coating. Used on window ledges, down pipes, walls, gutters - in fact anywhere which may be used as a grip point to gain unauthorised access. Anticlimb paint will make a surface virtually unclimbable and in addition the intruder becomes thoroughly marked and can be easily identified by police. The paint contains a hidden "indicator" which can be identified later by the authorities. "Vandalene" is available in Tile Red, Black, Green and Grey in the following tin sizes:- 0.8 kilo, 2 kilo and 4 kilo, it is also available as a 500ml aerosol in black only. Suitable for use on Wood, Metal or Masonry and many other surfaces. Identification signs are also available.